Erika Irish Brown, B.S.’91, global head of Diversity & Inclusion for Bloomberg L.P., returned to UAlbany as keynote speaker at the winter International Celebration, held Dec. 7 to recognize graduating international students, students who have studied abroad, exchange students, and visiting scholars. 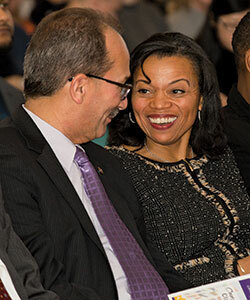 From far left: Erika Irish Brown is pictured at the International Celebration with UAlbany President Havidán Rodríguez; delivering the keynote at the event. 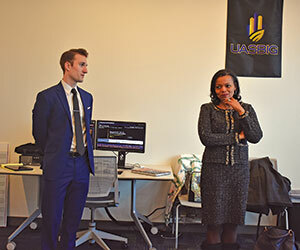 Brown addresses the University at Albany School of Business Investment Group (UASBIG) as student Nikolas Strom listens. 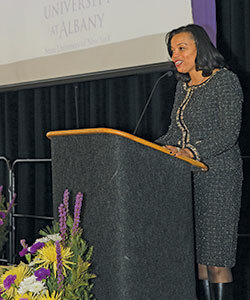 In addition, Brown reflected on her time at the University at Albany. “There are many things – mobile phone, personal computer – I wish I had as a college student. … While there were a lot of things I did not have, I did receive a stellar education – an education that enabled me to compete with my contemporaries as a financial analyst at an elite Wall Street firm upon graduation. 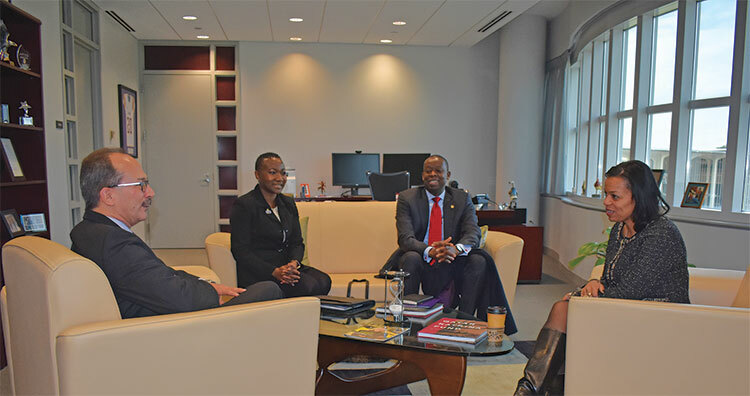 Brown speaks with Rodríguez, Winsome Foderingham, B.A.’89, M.P.A.’92, of University Advancement, and Harvey Charles, Ph.D., dean for International Education and vice provost for Global Strategy.